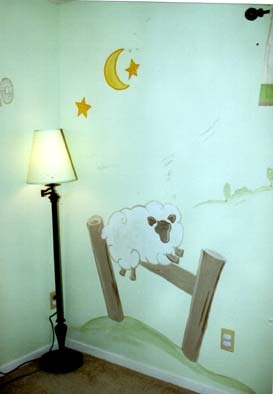 "Sandy painted a beutiful lamb theme in my nursery. I got bedding from pottery barn kids and showed her an idea of what I wanted. It actually turned out even better than the idea I showed her. 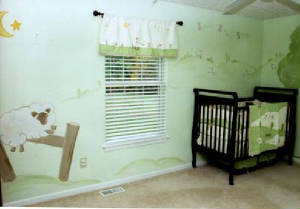 The room was cute before, but very plain & borring. I didn't relize how plain it was until I saw it finished with the mural. The room is different than any I have seen. I can't wait to have the baby. The cost of the work was definatly worth the reasonable price. 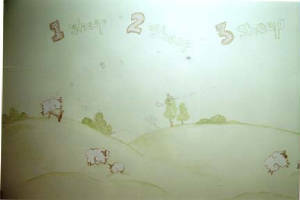 I love the mural & will be contacting Sandy in the near furture to paint a mural in our basement. -Can't wait!